About halfway between Milan and Venice, Verona is one of Italy's most popular cities for tourists, who revel in its art, architecture, opera, and literary fame. It lies in the sweeping S-curve of the River Adige as it emerges from the Alps. Verona's Centro Storico, the historic center, where you'll find most of the attractions, is linked with the left bank neighborhoods by ten bridges. Because Verona is so often overshadowed by its glamorous neighbor, Venice, tourists often try to see it in one day, but there are so many things to do here that you'll want to spend longer in this charming city. 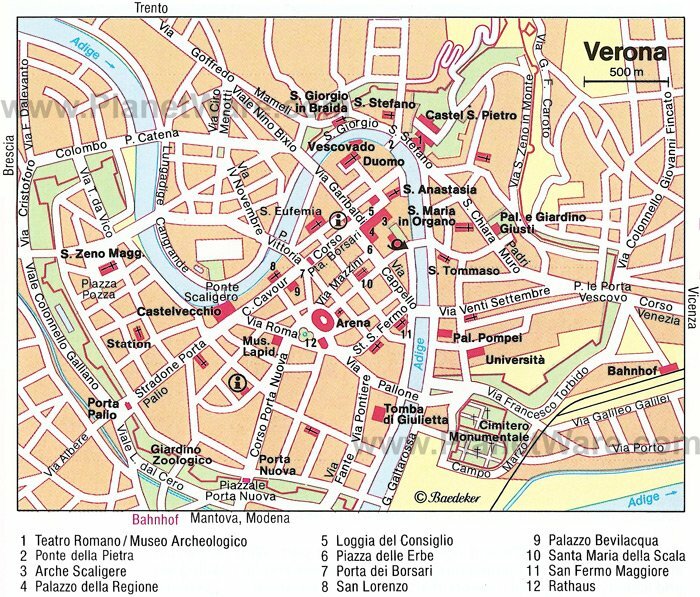 Verona became a Roman colony in 89 BC and developed into an important town. There are several remains from this time, including the Roman amphitheater, and the city is equally rich in Romanesque churches from the 11th and 12th centuries. Verona was an important artistic center in the Renaissance and earlier, under the powerful della Scala family. You'll meet them everywhere, referred to as the Scaligeri. The leading 15th- and 16th-century architects were Fra Giocondo and Michele Sanmicheli, who were responsible for several splendid buildings and the bastioned town walls. On the banks of the Adige, Castelvecchio was built by the Scaligeri in 1354-55, an impressive defensive fortress certain to remind any rivals of the power of the della Scala family. Crossing the river is the beautiful castellated Ponte Scaligero, a 14th-century bridge that's traffic free and a favorite stroll for local families. The castle's main tower and ramparts afford views of the bridge, the city, and surrounding hills. The castle interior has been brilliantly restored and transformed into bright exhibit space by architect Carlo Scarpa, without sacrificing the integrity or history of the castle. The collections of the Civico Museo d'Arte are shown here, featuring Veronese sculpture, applied art, and paintings, with works by Bellini, Rubens, Montagna, Guardi, Tiepolo, Tintoretto, Pisano, and artists of the 15th- and 16th-century Veronese school. A few steps up Corso Cavour is the Arco dei Gavi, a first-century stone arched gate that spanned a Roman road; look for the grooves worn by chariot wheels in the stone below the arch. One of the largest of its kind and among the best preserved Roman amphitheaters, Verona's arena was built in the reign of Diocletian, about AD 290. Only four arches of the outer wall on the north side have survived, but the vaulting seating is intact and in regular use. Its 44 rows of seating can accommodate 22,000 spectators, and in July and August, it is the home of the Verona Opera Festival, one of Europe's major summer music events ranked with the Bayreuth and Salzburg festivals. The arena forms one side of the wide Piazza Brà, opposite the Palazzo Malfatti, created by Sammichele. Adjoining the long building of the Gran Guardi,the old guard-house from1614, is the gate and tower of Portoni della Brà. 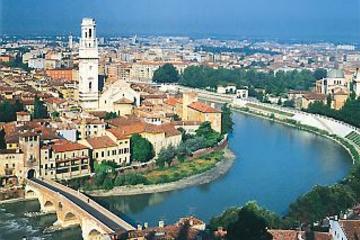 Verona is perhaps best known internationally as the setting for Shakespeare's famous tragedy, Romeo and Juliet. Inevitably, tourists asked where the star-crossed lovers lived, and Veronese obligingly pointed out a small medieval palazzo just off Piazza delle Erbe that had an attractive courtyard where tourists could stand without blocking the street. In the 1930s, the city added the missing ingredient, building a balcony overlooking the courtyard. Several decades later they added a bronze statue and set up displays inside the house for tourists to look at on their way to be photographed on the balcony. No matter that the story is fiction, the characters purely imaginative, and the plot not based on any actual events or people in Verona (where Shakespeare had never been), the city has still become a place of pilgrimage to the point where they hire a team of secretaries to answer mail left for the mythical Juliet. The large 11-12th century Basilica of San Zeno Maggiore is considered the finest Romanesque building in northern Italy. The beautiful main front of alternating strata of brick and white tufa is flanked by a slender Romanesque campanile (1045-1178) and the 14th-century battlemented defensive tower of a former Benedictine abbey. Although you enter through the elegant Romanesque cloister via a gate at the side, be sure to see the bronze doors on the front portal, with outstanding Romanesque reliefs of Biblical and secular scenes. The interior has an unusual 14th-century timber roof and beautiful Romanesque capitals. In the aisles are frescoes from the 13th to 15th centuries. In the choir is a marble figure, thought to be 14th-century, of St. Zeno, the fourth-century bishop of Verona. His reliquary is in the crypt, which is quite unusual in that it is equal in size and prominence to the chancel above it. On the high altar is a 15th-century Madonna with Saints by Mantegna. The central feature of Verona's Centro Storico is the rectangular Piazza delle Erbe, one of the most picturesque squares in Italy. It stands on the site of the Roman forum and is now a fruit and vegetable market. In the center of the square is the 16th-century Berlina, a canopy on four columns, formerly used for elections. To the north of it is a fountain from 1368 with the Madonna di Verona, an ancient marble statue that was repurposed in medieval times. At the north end of the square, a marble column holds the lion of St. Mark, the emblem of Verona's former Venetian rulers. At the northeast corner stands the Casa Mazzanti, originally built by the Scaligeri. Like many houses here, it is adorned with Renaissance frescoes. On the north side of the square is the Baroque Palazzo Maffei from 1668, and to the left of this, the 1370 Torre del Gardello. The Casa dei Mercanti at the corner of Via Pellicciai was rebuilt in 1878 in its original 1301 form. Opposite, rises the 84-meter-high Torre dei Lamberti, with a medieval bell, El Rengo. A lift from the courtyard side takes you to the top for one of the best bird's-eye views of the old town. From the end near the lion of St. Mark, Corso Porta Borsari is interrupted by Porta dei Borsari, a Roman city gate built in the first century AD and restored in 265. 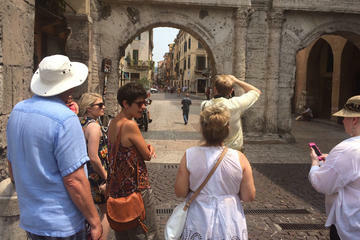 At the opposite end is the pedestrianized Via Mancini, Verona's most fashionable shopping street. Accessed through an archway from Piazza delle Erbe, Piazza dei Signori is surrounded by palaces, and in the middle stands a monument to Dante erected in 1865. The Palazzo della Ragione (Town Hall), on the south side of the piazza was begun in 1193 but altered in later centuries. The main front of the building is Renaissance, dating to 1524. In the courtyard are a Gothic grand staircase from 1446-50 and the entrance to the Torre dei Lamberti. Also in the square are a battlemented tower and the Palazzo dei Tribunali, converted in 1530-31 from a Scaliger Palace and with a Renaissance doorway by Michele Sanmicheli. On the east side of the square is the Palazzo del Governo, originally another Scaligeri palace and also containing a doorway by Sanmicheli. On the north side of the Piazza dei Signori stands the Loggia del Consiglio, one of the finest Early Renaissance buildings in Italy. It was built by Fra Giocondo from 1486 to 1493, and is crowned by statues of famous citizens of Verona. Recent excavations here have uncovered a Roman street, mosaics, and other remains below the current street level, which you can explore from an entrance off the adjoining large courtyard. The lovely little church of Santa Maria Antica was completed in the 12th century and became the family church of the della Scala princes, who ruled Verona in the 13th and 14th centuries. Their imposing Gothic tombs almost overshadow it, topped by their effigies in full armor. Look for their symbol: the ladder (scala) was the heraldic emblem of the family and frequently recurs in the elaborate wrought-iron railings. Above the church door are the sarcophagus and a copy of an equestrian statue of Cangrande della Scala, who died in 1329 (the original is beautifully displayed at Castelvecchio). To the left are the mural monument of Giovanni, who died in 1359, and the sarcophagus of Mastino I from 1277. Inside the railings, under a canopy, are the sarcophagi and equestrian statues of Mastino II and Cansignorio, who died in 1351 and 1375 respectively. The cathedral is a 12th-century Romanesque basilica with a 15th-century Gothic nave. Adjoining it is a campanile on a Romanesque base, designed by Sanmicheli but not completed until 1927. On the beautiful main doorway of the cathedral are figures of Charlemagne's two paladins, Roland and Oliver, done between 1139 and 1153. Inside, on the first altar to the left, is the church's primary highlight, Titian's 1525 Assumption, and at the end of the south aisle is the Gothic tomb of St. Agatha, from 1353. Especially striking are the red marble pillars and marble choir-screen. To the left of the cathedral is a Romanesque cloister built in 1123, with an early Christian mosaic floor on the lower level. A Gothic church from the late 13th century, Sant'Anastasia towers above a little piazza in the heart of Verona. Over its portal are scenes from the life of St. Peter carved in stone, and above them, a 15th-century fresco. Just inside, a pair of grotesques carved from marble hold holy water fonts, the left one by Gabriele Caliari, the father of the artist Paolo Veronese. Don't miss the fresco of St. George and the Princess by Pisanello. Behind the 16th-century Palazzo Giusti is the lovely garden, Giardino Giusti, with paths among its formal parterres, past statues, and a hedge maze. Another path leads from the back, up the steep embankment to a less formal garden with a grotto and views of the city framed by beautiful old cypresses. Although it's not the largest, it is ranked among the best Renaissance gardens in Italy. Especially in the summer heat, it's a peaceful retreat from the city. Across the Roman bridge of Ponte Pietra, on the hillside below Castel San Pietro, the Roman Theater was built in the first century during the reign of Augustus and excavated between 1904 and 1939. Of the theater itself, you can see the remains of the stage building's tufa walls and stones in the stage pit with holes where the ropes were drawn to open and close the curtains. More remnants are visible of the auditorium, which was built into the hillside in galleries and terraces, including the floor of the orchestra seating with geometric inlaid marble. The theater is the home of the summer Verona Jazz Festival. The Roman bridge, Ponte Pietra, was blown up during World War II, as were all Verona's bridges, but after the war, the stones were retrieved from the river and painstakingly sorted and reassembled into the bridge that crosses here today. The first San Fermo Maggiore was built in the eighth century in memory of saints Fermo and Rustico, believed at the time to have been martyred in the arena. It was replaced in the 11th century with the present structure, and the crypt is the only surviving part of the original. The current church retains its 11th-century Romanesque lower portion, with a Gothic upper section from the 13th-14th century. The facade is beautifully decorated in marble. The church houses a 14th-century wooden crucifix and Alessandro Turchi's Adoration of the Shepherds. Look for the Pisanello frescoes above the Brenzoni monument, and more frescoes surrounding the ornate pulpit. Fifty kilometers south of Verona, the provincial capital of Mantua was the residence of the Gonzaga family from 1328 until 1707, and they made Mantua one of the most refined and cultivated of princely capitals, a great center of art and learning. Their sumptuous residence, the massive Palazzo Ducale, dominates the town and is still one of Italy's most splendid palaces. Today, it houses several important collections, including paintings, Greek and Roman sculpture, medieval and Renaissance sculpture, and tapestries made from cartoons by Raphael. These are displayed in opulent rooms decorated with frescoes, ceiling paintings, and richly sculptured ceilings. Also in the center of Mantua, the church of Sant'Andrea is a masterpiece of Early Renaissance architecture built by Leon Battista Alberti in 1472-94, with a transept and choir from 1600. Mantova's third major attraction is the single-story Palazzo del Te, built for the Gonzagas between 1525 and 1535 by Giulio Romano. It is decorated with beautiful frescoes and stucco work. At the tip of a long promontory reaching out into the southern end of Lake Garda, about 40 minutes from Verona, Sirmione could be a stage set. You enter the town across a drawbridge, at the foot of a picture-perfect castle, Rocca Scaligera, built in the 12th century by Verona's ruling Scaligeri family. After touring the castle's restored rooms, climb to the tower for views across the lake and town. Stroll along Sirmione's main street of chic shops and walk or take the tourist trolley to the far end of the peninsula. Here, the Roman poet Catullus, who lived from 84 to 54 BC, built a villa to take advantage of the sulphur springs, which are now used by a luxury spa. The remains of his villa, Grotte di Catullo, and the complex surrounding it are extensive and worth exploring both for their history and for the beautiful lake views. Luxury Hotels: In a well-preserved palazzo, Due Torri Hotel shares a little piazza with Sant'Anastasia, one of Verona's top attractions. Bountiful complimentary breakfasts, a rooftop restaurant, and exceptional concierge service distinguish this historic property. In the old center near Piazza delle Erbe, a five-minute walk to the Arena, Academia Hotel serves an excellent free breakfast. Also overlooking Via Mazzini, Escalus Luxury Suites Verona serves made-to-order breakfasts that are brought directly to its stylish rooms. Mid-Range Hotels: On a quiet back street just off Piazza Bra next to Arena, Giulietta e Romeo Hotel has some rooms with balconies. On the main street connecting the rail station (and airport bus stop) to the Centro Storico, Best Western Hotel Firenze is a 10-minute walk from the Arena and on a direct bus line. Along with rain showers and free continental breakfast, Hotel Milano has a rooftop terrace with a tiny pool and café overlooking the Arena; on opera and concerts nights you can hear the music drifting up. Budget Hotels: On a quiet street between the Roman Arena and river, Best Western Hotel Armando offers guests free on-street parking and complimentary breakfast and Wi-Fi. Hotel Trieste, five minutes from the Arena on the main street between the rail station and old town, has brightly furnished rooms, complimentary breakfast, underground parking, and free bicycles. Just off Piazza Bra, between the Arena and Castelvecchio, Hotel Torcolo has plain but well-equipped rooms, a very helpful staff, and parking spots. Verona sits at the heart of some of Northern Italy's most popular attractions, a stop on the main train route between Milan and Venice, each less than 90 minutes away. Closer to Verona and also on the train route to Venice are the elegant Palladian villas of Vicenza and Renaissance Padua with its shrine of St. Anthony and magnificent Scrovegni chapel lined in frescoes by Giotto. The many well-preserved Roman remains of Brescia and romantic, medieval Bergamo, perched high on a hilltop, lie west of Verona. Only half an hour away is Lake Garda, surrounded by pretty towns and filled with recreational options and family attractions.